Tucked away between Monroe and Escambia County in south Alabama is a little known gem, Little River State Forest (LRSF). Consisting of approximately 2,100 acres of longleaf pine forest, this area provides a unique setting for many outdoor activities such as hiking, camping, fishing, and horseback riding. Although hunting is not allowed on a large scale at Little River State Forest, it has the unique identity as being one of the few "handicap" hunting locations within the state of Alabama. The rules and regulations for this hunting privilege are controlled and monitored by the Alabama Department of Wildlife and Freshwater Fisheries Division of the Alabama Department of Conservation and Natural Resources. Fishing, hiking, and swimming are all offered at LRSF. These activities are available for a moderate entry fee. Boats are available for rent by the day. Paddle boats are also available by the hour. There are six pavilions that are rented out for the day, in varying dimensions to accommodate different group sizes. While on the trails there are plenty of chances to view the ample wildlife, from deer and turkey, to rabbits and quail, or even a bobcat or fox. Many bird watchers find this a very unique area to find birds of all types. Cabin reservations can be made at the park office, as well as reservations for the pavilions. If you have your own trailer, the park provides electricity and water hookups, and if necessary there are sewage hookups. There is unlimited space for the person who likes to "rough it" in the wild. Bring the whole family . . . there is a little something at Little River for everyone. Formerly known as Claude D. Kelley State Park, the main goal for this site was to provide the general public with an aesthetically pleasing location to enjoy outdoor entertainment and adventure. Various events are held at the park facilities including family reunions, church functions such as Easter sunrise service, weddings, Boy Scout and Girl Scout activities, or simple afternoons swimming with friends and family. The central attraction is the 25-acre lake that provides a wonderful place to cool off during a hot day. While swimming or sliding down the lake’s spillway is a favorite activity for children in the summer, it also provides a nice spot for boating and canoeing year-round. Many anglers have caught their limit of fish here as well. 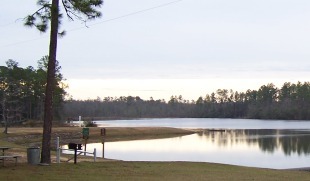 Today LRSF is owned by the Alabama Forestry Commission and the Claude D. Kelley Recreational Area at LRSF is operated by Ikner Outdoor Management Services. Not only is the natural beauty of the forest important, but the overall health of the forest is a primary focus for the agency. A healthy forest provides a better setting to educate the state's citizens about longleaf pine forests. Selective harvesting of timber and prescribed burning are just a few of the forest management tools being practiced on the forest to help accomplish this goal. Originally privately owned land, Little River State Forest was deeded to the Alabama Forestry Commission in the early 1930s. During this time, the Great Depression was taking its toll on America. President Franklin D. Roosevelt implemented several ideas to help pull people out of the Depression and back to work. One of these programs was the Civilian Conservation Corps (CCC), designed to help rebuild natural resources by planting trees and constructing park facilities. In 1934, the CCC was sent to the Atmore, Alabama area to build a public park that would eventually become known as Little River State Forest. Many of the facilities located on the grounds of the park remain from the original construction by the CCC, including the office building, a cabin, and pavilions. The Gazebo Trail was also built by the CCC, as well as the 25-acre lake. The soil that was removed from the lake bed was used to construct the dam and levee. Iron stone was collected from the area to create the spillway. This is a beautiful location that many people have used over the years as a backdrop for photos and weddings.